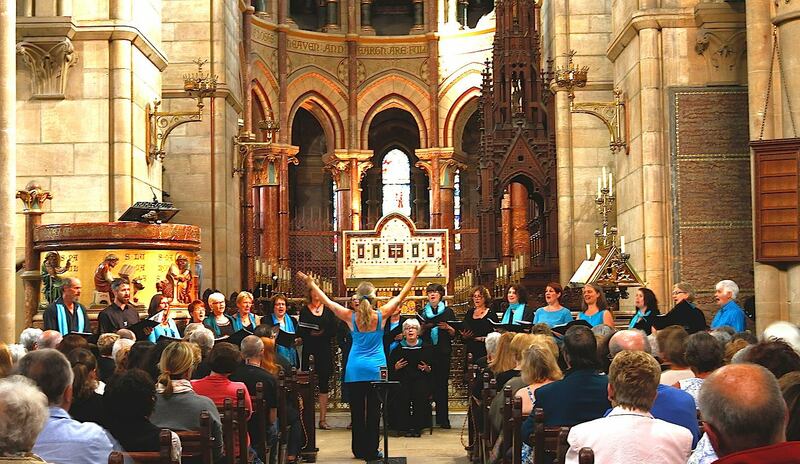 During the winter I had been approached by a Tour company in England asking whether I would be interested in getting involved with organising an exchange with The American Tapestry Choir during their visit to Ireland, by lining up a joint concert with our choirs for their visit to Cork. I was lucky enough to be able to secure St. Finn Barres Cathedral for the evening performance. What a treat that was to sing in there! And the American Choir were of course thrilled too! In the afternoon we met and sang with them in the Camden Palace Hotel ballroom (Community Arts Centre), sharing and learning a few songs together which we then performed later on in the concert. It was wonderful to meet with this 40 strong choir, and a great opportunity for bringing Acapellabella and Kinsale Voices together again.